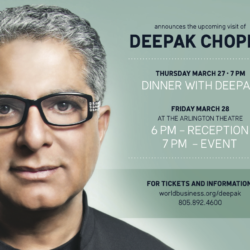 Join the World Business Academy in welcoming renowned mind-body expert and futurist Deepak Chopra, M.D. 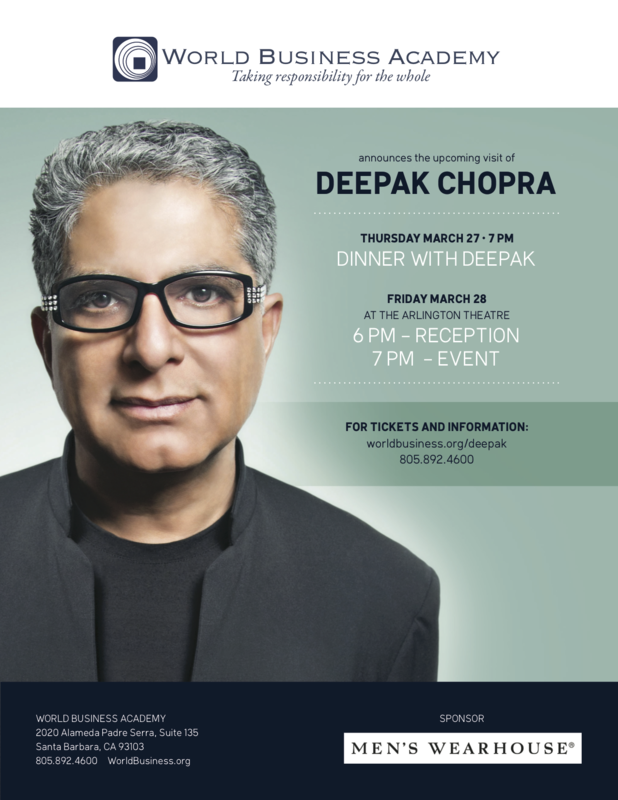 Dr. Chopra will speak on topics close to his heart over two days of events in Santa Barbara, culminating in a major address at the Arlington Theatre at 7 pm on Friday, March 28th. Dr. Chopra is appearing under the auspices of the World Business Academy, a local think tank and action incubator of which he is a Fellow and with which he shares a vision of a future liberated by safe energy. Chopra is the author of more than 75 books published in over thirty-five languages with numerous New York Times Bestsellers. He serves as an Adjunct Professor of Executive Programs at Kellogg School of Management at Northwestern, Adjunct Professor at Columbia Business School, Columbia University, Senior Scientist with The Gallup Organization and Faculty, Disney Imagineering. He is heralded by Time Magazine as “one of the top one hundred heroes and icons of this century”. Esquire magazine named him one of the top ten motivational speakers in the country and Toastmasters International honored him with the Top Five Outstanding Speakers award. He is the co founder of The Chopra Center for Wellbeing and founder and Chairman of The Chopra Foundation. The Chopra Foundation is collaborating with the World Business Academy on The California Moonshot Project, an all-out effort to convert California to 100% renewable power and bring about shift in consciousness from one of exploitation to one of stewardship. Click here to listen to the radio announcement playing all around Santa Barbara. In addition to his Arlington engagement, Dr. Chopra will be speaking at smaller gatherings on March 27th and 28th on such topics as life extension and anti-aging, creative healing, mitigating climate change by reducing carbon emissions, and his quest to shift the consciousness of 100 million people.